Published on February 22, 2009 in Community Center Use and Outreach. Closed Tags: Add new tag, building use, charges, Community Center Use, Event Center, facilities, fees, scouts. Our handsome building is not only our church home; it is also an Event and Community Center which we offer for use by others. 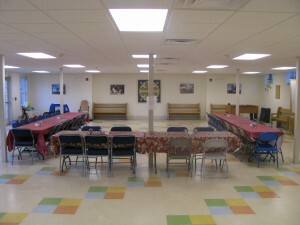 The Parish Hall downstairs offers meeting and dining space for as many as 150 people. The open space and flexible furniture are ideal for committee and community group meetings, parties, receptions and scout groups. 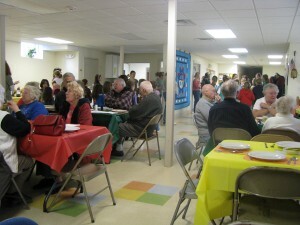 The Parish Hall / Event Center can seat more than 150 people for meals, parties, meetings. Adjacent to the Parish Hall is a full modern kitchen. Upstairs, the Gathering Space just inside the front door is a warm room with table and chairs suitable for meetings of a dozen or fewer people. For special occasions the Worship Space can also be used for meetings. To apply to use Holy Cross Event Center facilities, please first view the calendar, or contact the Event Center Coordinator (Laura Starr-Houghton 603-660-1437 or LStarrH@comcast.net), to see if the date and time you want are available. If they are, please fill out the Building Use Application and return to the address listed. We will make arrangements to meet you at the Community Center to show you around and discuss your needs and plans. Please be advised that most weekday afternoons and evenings are booked for the entire school year by scout and other groups. Weare seniors enjoy a holiday meal served by the Girl Scouts in the Parish Hall / Event Center. We are currently updating the schedule of fees for the use of the Community Center, counting on the generosity of users to make donations to help us defray our costs. If yours is a not for profit use, a nominal donation would be appropriate if you can afford it. If it is a private party or a for profit use, a more substantial donation would be expected, depending on the extent of your use, number of people involved, and your budget and finances. We require that all trash be removed by you after your use and that you clean the space and return it to the state (including furniture set-up) in which you received it. You can also make arrangements to hire our cleaning service, which we recommend if you intend to serve a meal. For private parties where food is being served, we may require you to hire this service, in which case we may ask for a deposit to cover cleaning costs. We reserve the right to decline to make our facilities available for uses inappropriate with the mission and ministry of Holy Cross or the Episcopal Church, or that might infringe on the rights of our neighbors. We have a policy regarding the serving of alcoholic beverages which must be complied with. Our Community Center is a smoke-free environment. The first thing people notice about Holy Cross is that we have a wonderful new building. It was consecrated in 2005, the culmination of the dreams and work of our congregation over several years. Attached to it is the tiny, historic building in which Holy Cross worshiped for over 100 years. Today this building, built in East Weare in 1893 and moved to its present site when East Weare was condemned for the flood control project in 1960, is used for children’s formation programs. Published on August 14, 2008 in Building and Facilities. Closed Tags: Chris Gosey, iconography, mosaic. 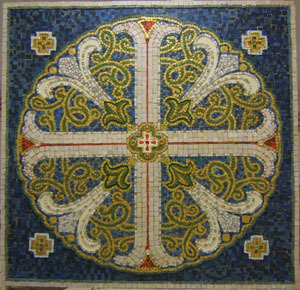 The mosaic icon designed by Chris Gosey and assembled with the help of parishioners contains much Christian symbolism, in the colors and shapes as well as the materials used to construct it.